A dessert parfait trifecta: Tahitian vanilla pudding, butterscotch pudding, and banana pudding, topped with crumbled waffle cone bits at a Southern buffet restaurant, when you’re already full fit to burst. And mind you, these are real puddings, made with fresh cream and locavore eggs, grown by Miss Sally Mae. Black truffle, and the well-bred Breton house pig that rooted it up. Note that this pig, né Napoleon (naturellement! ), runs away if your accent is not pitch-perfect. Ceylon tea, and an anonymous Impostor, cloaked in obscurity, observes–minority report–that like Julia Roberts, the Finealta has a nice nose, but kind of a weird mouth. The two of us with taste and discrimination got fudge brownie batter, with cayenne pepper baked in an old thick copper bundt pan in a Tuscan oven by a Michelin 3-star chef moonlighting as a pastry apprentice in the excellent hipster bakery around the corner from Stephen’s place. Crushed red ants adhering to flip-flops, whose pheromonic chemical “attack” signal is being broadcast with minimal interruptions from nearby cell phone towers and kitchen herb gardens. Finishing with peach nectar poured from a platinum can, introduced by Tiffany’s as their first, poorly-conceived entry into the non-existent Luxury Fruit Canning industry. Diaphanous delight down the stretch, twinkling like a Twilight vampire, dancing like Donald O’Connor, swinging like Ella. 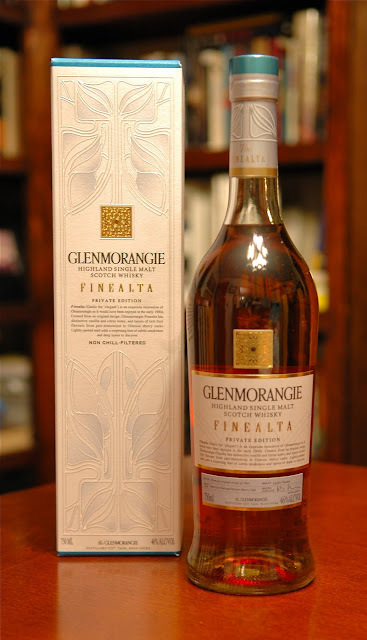 The Glenmorangie Finealta is Ansel Adams–His pictures are worth more than all the combined words of the Malt Impostors, and that’s saying a lot. Or showing a lot. Or something. —Our thanks to David Blackmore and the good people at Glenmorangie for the sample! Slàinte!